R7S LED bulb 78mm/118mm/135mm/189mm from AIS – leading R7S LED lamp manufacturer and supplier in Shanghai,China. R7S bulb is a kind of double-ended lamp and lighting source. 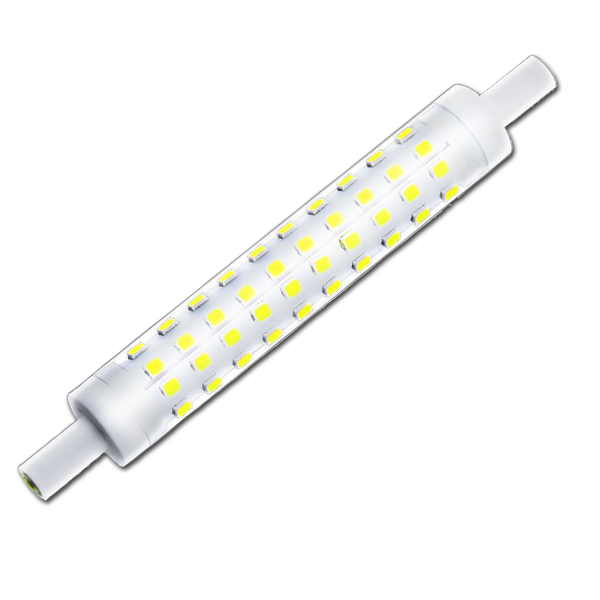 The common R7S is divided into halogen double-ended bulb and metal-halogen double-ended lamp.The length of R7S can be 78mm,118mm,135mm and 189mm. R7S LED bulb is made with LED lighting source. With the development of LED lighting technology,more and more people are choosing R7S LED bulb to replace double-ended tubes R7S halogen lamp. Because of the low light efficiency and short lifetime of traditional R7S halogen lamp, it is undoubtedly the best choice to replace them with R7S LED light. For example, 13W R7S LED 118mm can replace 150W halogen lamp 118mm with higher lumens. According to the calculation of 8 hours a day, it can save one kilowatt-hour a day, 365 kilowatt-hour a year! The color temprture of R7S LED bulb not only have warm white, but also have cool white, red, green and other colorful light. But the R7S halogen lamp do not have these features. So the R7S LED lights are more and more popular now. Our R7S LED lamp can be used in advertising, plaque lighting, landscape lighting, Hotel exterior wall lighting, factory workshop lighting, parking lot lighting, clothing store lighting and other occasions. Also, as some r7s can be used with dimmer,we have designed new model which is dimmable R7S LED bulb. If you’re looking for dimmable R7S led lamp,we’re the best R7S led bulb manufacturer that you can choose. For R7S bulbs, whether 78mm or 118mm, you can invest in an LED R7S lighting solution from AIS LED. Innovative LED lighting technology is taking over metal halide lamps because LED lighting has proven to be reliable, versatile and energy efficient. You can choose from a variety of R7S LED lights ranging from 8 to 40 watts and from 78mm to 189mm. Our LED R7S lights can save you up to 85% in energy usage compared to traditional halogen lighting. Most of our LED R7S light has a lifespan of over 50,000 hours. It’s wise choice to convert traditional R7S lighting into more energy efficient LED R7S lighting, with all LED R7S bulb containing no mercury. For more information about our LED R7S lighting, or to order any of the R7S LED shown below, just contact us. Our LED lighting experts are waiting to communicate with you. As a leading R7S LED bulb manufacturer in China, we will advise you on our best R7S LED lamps for sale to meet your needs. Both dimmable and non-dimmable R7S LED lamp is available ! This R7S LED bulbs is our new model. Both dimmable and non-dimmable R7S LED light is available ! Your R7S lighting fixture may have dimmber or not. Don’t worry ! Our R7S LED have two type. One is dimmable R7S LED lamp, the other is non-dimmable R7S LED lamp. So if you’re looking for dimmable R7S LED lamp, we are your reliable R7S LED light supplier. If you’re looking for non-dimmable R7S LED lights,you can also choose us ! You do not have to choose between inefficient incandescents and fluorescents that contain mercury. Our R7S LED light is safe, environmentally friendly and contains no toxic mercury.Our R7S LED lamps use 10%-30% energy to traditional lights. As we know,consuming less energy results in fewer greenhouse gas emissions being released into our environment. We design all our R7S LED lighting with Sumsung 2835 LED chips. This means our R7S LED lamp has high lumens which is more than 110lm/w. Using our LED R7S lights will help you and your clients to save more energy and money. With our professional technical team, we design our R7S LED bulb from 78mm to 118mm with the most attactive appearance. LED lighting is the most gorgeous lighting that illuminates people and surroundings in colour-rich light. Our LED R7S lighting is designed to blend seamlessly with any architecture. Also,the proprietary diffusing lens and reflector system delivers an optimal light distribution. We use high quality LED driver with our LED R7S light which has SPD protection. Also we use innovative cooling technology to make the heat transparent to air easily. This will ensure our R7S LED bulb with 50,000 life span. What is 50,000 hours? If you ran one LED lamp for 6 hours per day , it would last for nearly 23 years. So you may never change another light for long period. Whether you replace your lights with our R7S LED 78mm or 118mm , you can install it easily. All you need to do is to remove the original light, then you can position the R7S LED lights. So we are really your reliable R7S LED bulb supplier. Which model should I choose to replace my original halogen bulb ? You can choose the model of R7S LED bulb according to the length. For example,our 8W R7S LED 78mm is designed to replace 100w R7S halogen 78mm. Our 12w r7s LED 118mm can replace 150w r7s halogen 118m. You can check the length of your lamp. Then you will know which model to choose. Here is the Halogen Lights Vs. LED. All our R7S LED lights have SPD. This will ensure the safety when use our LED lighting. Also the SPD will make sure that our R7S LED light can be used more than 50,000 hours. Is it easy to install R7S LED lights ? Yes, It couldn’t be more easily to intall our R7S LED lights. For example, if you want to intall 78mm R7S LED light,you can remove the original R7S halogen lamp. Then you can install the 78mm R7S led light.You don’t need to do other extra work. Can I use dimmer with your R7S led light ? You can use dimmber with our R7S led lamp. First, you need to choose our dimmable R7S LED lamp. Then you can use dimmer with our R7S led light. Please remember do not choose the non-dimmable model ! What's the warranty of this R7S LED Lamp ? Normally, we offer 2 years warranty for our R7S LED lamp. This is why we are the reliable R7S LED lamp manufacturer. But it does not mean our R7S LED lamp can be used for only two years. In fact, the lifetime of our R7S is about 50,000 which means more than 10 years. For example,one mobile phone can be use for 5-10 years,but the brand can offer only 1 year warranty. How can I calculate Lumens to Kelvin for these R7S LED lamps? Many customers asked us how do you calculate how many lumens with a certain kelvin. Some R7S LED lamp manufacturers don’t have this answer on their page. In fact, these are two measurements that are not directly related. Kelvin is not a measure of brightness rather it is a measure of color temperature. If you are looking for brightness, the proper measurement to look for is lumens. In general though, 5000K or cool/daylight white will a appear brighter than 2700K all things being equal but this is due to the higher contrast of such light.